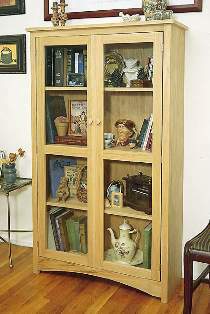 This bookcase measures 60"H x 35"W x 12"D. Order hardware parts package separately below. Craftsman Bookcase Hardware includes hinges, magnetic catches, retaining buttons, wood knobs, dowel pins and mounting screws. Project plan, wood and wood finish are not included.